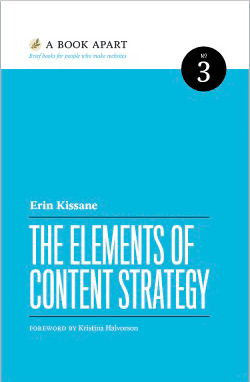 This is a sample chapter from Erin Kissane’s book The Elements of Content Strategy. 2011, A Book Apart. Because content has so frequently demonstrated its potential to derail Web projects, and because it is uniquely entangled with business strategy, it requires special attention. Throughout each project, a content strategist compares evolving content-related expectations with available resources, and warns the team of shortfalls that may require that the content work be scaled back or the resources stepped up. She navigates the politically fraught territory of distributed publishing, and long after information architecture and visual design work is approved, she keeps an eye on the ways in which organizational strategy changes affect ongoing content work. In short, she watches the hills for signs of trouble. To do content strategy, defined as the planning and leadership of content projects and online publishing endeavors, is to run point. The term run point derives from a military term for the soldier or soldiers who moved ahead of the rest of the advancing troops: the point man. An equally influential and appropriate use in American English refers to the cowboy who rides at the front of a herd of cattle. The current version of the Wikipedia article for “Take Point” notes in characteristically deadpan prose that: “It is a hazardous position that requires alertness and ability to deal with unexpected attacks.” Indeed. Paradoxically, if your content strategist spots a problem late in a project and takes a hit—either by doing extra work or mandating a brief delay—that means the process is working. If someone’s going to hit a snag, you want it to be your content strategist…. In her role as point man, a content strategist works with other front-runners who lead various aspects of the project: information architects, technical leads, creative directors, and project managers. And in addition to leading content work, she plays a key role in what business consultants call risk management. Paradoxically, if your content strategist spots a problem late in a project and takes a hit—either by doing extra work or mandating a brief delay—that means the process is working. If someone’s going to hit a snag, you want it to be your content strategist, not the content creators or an SEO specialist or the person in charge of a database migration. So naturally, if you’re the one doing content strategy, you need to be able to sniff out trouble and react quickly when it does arise. One of the best ways to prepare yourself for upcoming challenges is to push yourself beyond the boundaries of the field you came from. And that means learning about the other fields from which content strategy descends. Marketers tend to characterize content strategy as a form of marketing—as do some technical communicators, though the latter group means it as an insult. Knowledge management people often say it’s a way of improving processes and setting standards. Longtime Web editors and writers tend to assume that it’s what they’ve been doing all along. None of them are dead wrong, but neither are they completely right. And as the definitional debates rage on, it’s increasingly clear that our discipline is vulnerable to being co-opted by nearby fields, or to being distorted by the fact that online, some of those fields are much louder and more public than others. That’s why we need to know our roots. If you know who you are—and how you got that way—it’s going to be much harder for someone else to define you into a corner. Not to mention that if you know at least some of the tricks and traditions and history of your tribe, you won’t have to reinvent it all by yourself. Designers have a pantheon they can point to: Paula Scher and Saul Bass, but also Bodoni and Gutenberg. Developers have cultural heroes like Alan Turing and Sir Tim Berners-Lee. These disciplines have legacies and shared principles. Design should communicate. Elegant code is better than sloppy code. Though it lacks a goat head, content strategy also has a legacy. Several, in fact. And each has plenty to teach us. A complete genetic breakdown would require a separate book, so for now, let’s consider the four most in influential fields: editorial work, curatorial work, marketing and persuasion, and information science. Real-world editing is much more about crack organizational skills, a habit of developing practical communication ideas, and the ability to deal firmly and diplomatically with the whole crew of people involved in getting a book, newspaper, or Web site from concept to delivery. Editorial work is so closely related to content strategy that questions about the difference between the two often arise. From the outside, content strategy can look quite a lot like the sort of editing found in magazines and newspapers. The editorial world, and that of publishing in general, has a lot to offer us. For people outside of the publishing industry, the title of editor may raise the specter of the cranky, scotch-drinking, overcoat-wearing, borderline dysfunctional editors played by the likes of Humphrey Bogart and Cary Grant. Alternatively, those traumatized as children by English teachers may expect an editor to pride herself on being a stickler and whack you on the knuckles when you split an infinitive. It’s true that an ear for correct language is helpful and that a passion for getting the story told right is indispensable. But real-world editing is much more about crack organizational skills, a habit of developing practical communication ideas, and the ability to deal firmly and diplomatically with the whole crew of people involved in getting a book, newspaper, or Web site from concept to delivery. Editors don’t just assign stories and make margin notes in blue pencil: they develop themes and narrative arcs, orchestrate responses to other publications and outside events, maintain a balanced variety of articles or books, evaluate and manage writers and other content creators, and much more. Leaving aside the knuckle-whacking, editors have plenty to teach us about handling content. It’s only by working tirelessly for our readers that we can genuinely serve our clients and employers. In publishing, if you don’t win, hold, and reward the attention of your readers—whether they’re fans of tabloid journalism or wistful MFA-program novels—you’re out of a job. Editors worth their salt work not for writers or publishers, but for readers. “Online, you don’t have a captive audience. You have a multitasking, distracted, ready-to-leave-your-site-at-any-time audience who has very specific goals in mind. Great writers know what their readers want and need to hear. But the responsibility for validating assumptions about the audience and tuning the content to suit that audience remains with the editors—and now the content strategists—of the world. Paradoxically, it’s only by working tirelessly for our readers that we can genuinely serve our clients and employers. Humans are compulsive storytellers. We think and teach and connect by creating stories. And the thinkers who change opinions, the teachers who inspire students, the politicians who win elections, and of course, the publishers who sell books and magazines all tend to have something in common: they can tell a great story. For anyone who communicates as a profession, stories are the ultimate hack. Whatever corner of the publishing world they come from, editors know how to help other people tell the best, most engaging stories they can tell. Content people with backgrounds in journalism or publishing usually have the basics of storytelling down cold, but the rest of us can learn from the storytelling principles of these fields—from the basics like building a lead that hooks the reader—and supporting it with facts and quotations—to sophisticated techniques for layering in secondary narratives. The inverted pyramid—This term describes a classic news story structure in which all the most important basic information appears at the beginning of the story, and is followed by less important information ordered from most important to least important. Five Ws and an H—You may remember this one from grade school. It’s intended to remind writers that they need to explain the basics of every story: what happened, who is involved, when and where it happened, why it happened, and how it happened. If you happen to be writing marketing copy, this might translate to what the product is, who it’s made for, why the intended audience should buy it, how it works, and when and where you can get it. Show, don’t tell—Instead of going on and on about how wonderful and leading-edge your widget is or how much your client cherishes its mission statement, give evidence. Show results, statistics, case studies, personal narratives, and demonstrations of action, and give the puffery a rest. But why bother with all that if you’re not going to be creating the content yourself? Primarily, because most content strategy projects deal with narratives: brand messages, overarching themes, and communication plans all center on the reader’s progression through a series of ideas. And secondarily, because if you’re going to design guidelines and processes for content creators, you need to understand narrative well enough to give them the right tools for telling strong stories. Finally, a word on working with storytellers. One of the spookiest aspects of the editorial craft is the ability to nudge, cajole, or otherwise wrangle each author into producing his or her best work without diluting the individual author’s voice and perspective. It’s tricky as hell and requires an ever-shifting balance of tact and frankness. Whenever you approach content creators, it’s worth spending a little extra effort on communicating with them in ways that neither devastate nor condescend. If you need to produce useful, high-quality content…, you need an editorial process that will support creation, review and revision, publication, performance tracking, and ongoing maintenance. Both problems are caused by underestimating the time, attention, skill, and money required to plan, create, and publish content, both immediately and in the long term. As a species, we’ve been doing all that since about 2000 BC, so we happen to know quite a lot about it. But before the Internet, the vast majority of people who had to worry about the nuances of publishing were…publishers. content custom-tuned for specific channels and audiences. Most importantly, editors can teach us quite a lot about how to regularly publish original content that readers can use. In part, they can demonstrate how to hire and manage writers who can listen to experts, and then collect and create content that extends well beyond executive bios and annual reports. Our clients and employers are beginning to understand that they need to do more than simply hire a Web writer at the end of a project and hope someone else will maintain the content later. As their content specialists, the more we know about solid editorial practices, the better we can help our clients with the transition to the new world of distributed online publishing. Useful content is expensive. This is a fact that editors have long understood, but Web companies have only just begun to discover. Leaving aside the effort required to publish a daily newspaper, consider just the people involved in book publishing: the acquisition editors, development editors, copyeditors, proofreaders, book designers, compositors, project managers, cover designers, and sales and marketing teams. In traditional publishing, these people are paid. As are the accountants, secretaries, printers, and everyone else who isn’t an intern. Now consider the marketing lead who receives word that he must now review and revise forty pages of content inherited from another department, ensure that new brand guidelines are implemented in all newsletters and emails, and produce an episode of the company’s new video series. In the next three weeks, with no budget increase, and without ditching other responsibilities. Understand existing resources—Are there people available to work on content? Are they good at it? What kind of training do they need? Are there other writers or editors in the company who might be made available to help? Is there a budget for hiring freelancers or new staff members? Make the business case for content strategy—How will the recommended content changes meet overarching organizational goals? Will they replace less efficient processes, and if so, what resources will they free up? Will they directly contribute to revenue increases by boosting sales? Cut costs by reducing customer service hours? Bring in new business by improving the company’s brand image? Prepare clients and managers for organizational change—Can we begin introducing new systems and processes well in advance of publication deadlines? If new people will be hired, can we help with job descriptions or make hiring recommendations? Can we refer talented, reliable freelancers? At the end of the day, we and our clients must remember that content is created—and revised and maintained only when a human being is assigned and paid to do so. The notion that content is expensive brings up another topic as well, though it’s one this book lacks the space to address. Within the field of content strategy, a sub-specialization dedicated to the business side of large-scale content production and distribution has begun to emerge. Although many organizations produce content under the aegis of marketing or fundraising, some are in the business of content itself. Publishers qualify, of course, but so does the sprawling beast we call the entertainment industry and the many new kinds of companies that have sprung up to take advantage of the Internet’s ultra-cheap distribution model. Content specialists who have a talent for financial strategy and the nerve to experiment will likely find this niche both interesting and lucrative. We must plan for the orderly acquisition, cataloging, and practical maintenance of the content in our care. But just as much, we must protect its essence and truthfulness, and keep it safe from creeping degradation of quality and tone. In a consideration of this evolution, art-world critic David Levi Strauss writes that curators “have always been a curious mixture of bureaucrat and priest,” balancing practical administration with the care of the soul. And as content strategist Dan Zambonini has written, these museum and gallery curators care for—rather than merely about—their collections. And this gets to the heart of our work as content strategists. We must plan for the orderly acquisition, cataloging, and practical maintenance of the content in our care. But just as much, we must protect its essence and truthfulness, and keep it safe from creeping degradation of quality and tone. In both of these contexts, curators can offer useful tools, frameworks, and lessons. Most of the content that most of us work with most of the time is not art. But the curatorial notion of consciously being with art—what critic Michael Fried calls presentness—is doubly relevant to our work. The degree of expertise, sensitivity, and good judgment required of prominent curators may seem excessive to the content specialist whose collections reside in databases, but this description of a curator’s work should be ringing bells. To do our jobs well, we must balance an understanding of the context in which content is created—sourcing, business goals, work ow) with an understanding of the context in which it is read and used—user needs, delivery channels. And immersion in both worlds is what makes the right balance possible. The second way in which curatorial ideas about presentness and focused attention cross into our discipline is all about the user. In effective museum and gallery installations, visitors are usually invited to spend time simply being with art—or artifacts or other content. Curators and exhibition designers understand that people require certain things to have concentrated experiences: things like unobstructed access, good light, and freedom from distractions. Now imagine going into a museum and trying to walk up to a Matisse, only to run into a glass wall ten feet away from the painting. To get past the wall—which is now frosted so you can’t see the painting at all—you have to write down your full name and address, and then show ID to prove that you are who you say you are. Once you’ve submitted to all this, you discover that the painting is only a small print— you have to go into another room full of billboards to see the original. Finally, you reach the painting. The descriptive label is written in miniature gray text on a slightly lighter gray background, so forget trying to read that, but here at last is the art. That’s when the circus clowns pop out of the woodwork and start honking little horns and waving signs advertising tooth-whitening products and diet pills. This is content online. The fact that anyone reads anything at all online is a demonstration of an extraordinary hunger for content. Leaving aside the distractions of email, other Web sites, and real life, we have built tens of thousands of Web sites around the idea that no matter how demanding, annoying, and abusive our sites become, our readers will keep coming back for our content. But is this really the best we can do? Of course it isn’t. And we should consider it part of our work as content strategists to ensure that all the effort and attention poured into creating and managing great content isn’t drowned out by interfaces that obstruct, annoy, and distract. 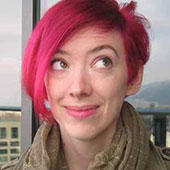 In a 2009 A List Apart article, designer and editor Mandy Brown challenges Web designers to create space for readers. Echoing d’Harnoncourt, Brown advises designers that to do so, they must first allow themselves to become absorbed in the text. In addition to attending to design considerations like whitespace and typesetting, we can act as user advocates by advising our clients and employers to reduce distractions in sidebars, fight ads that obstruct content, and give readers the equivalent of good light and a quiet room. This is one of the reasons that a multidisciplinary approach can potentially produce better results than content-only gigs for some kinds of projects—when content specialists can weigh in on presentation and design, readers benefit. As content advocates, we should be ready to contribute to the design of user experiences that involve our content. Much of the design and planning work done in major museums and galleries is not theoretical or even particularly curatorial. Curators and other museum workers deal with physical objects and corporeal humans in real spaces. And those humans, being mammals, need things like places to sit, reasonable ambient temperatures, wheelchair ramps and other accessibility aids, drinking water, and bathrooms. In larger museums, they also need security guards to protect them from each other, friendly staff members who can provide information in several languages, well designed maps, and someplace to get a sandwich and a coffee. On the Web, we deal with each other in heavily mediated ways, but we’re all still primates. We need accommodations for the thousand disabilities that we experience; ways of marking and saving information for later so we can take breaks; ways of skipping through content when we’re in a hurry; friendly orientation and navigation aids; access to real human assistance, via live help, telephone, email, or any other reasonable channel; and the ability to consume content on the devices and in the locations of our choice. But aren’t these user experience concerns? They are indeed. And as content advocates, we should be ready to contribute to the design of user experiences that involve our content. In short, we should strive to create and present content in ways that respect the fact that even when they’re using the Web, people need to pee. Museum and gallery curators often handle priceless, irreplaceable objects. Accordingly, they use formalized and meticulous processes for accepting, describing, and tracking the items they care for. Similar processes, applied to content, can significantly reduce the chaos of large-scale content projects, but they need not stop there. What information about content sources and types should we record to ease future display, reuse, revision, and expansion? When content is added or revised, how can we usefully document the reasons for the change? And how can we ensure that ongoing, distributed revisions t within a larger communication strategy? What processes might let us track and reuse our content resources over time? What kind of reporting, analysis, and publishing tools would such tracking and reuse require? How can we structure our content to promote reuse in interesting ways? How might we use analytics and other tools to understand which assets we’re underusing? We’ll return to some of these notions in a few pages, but for now, it’s worth noting that a curatorial approach to long-term content management crosses over into the domain frequently occupied by IT teams, marketing departments, and the Webmasters of the past. Content strategy is not a subset of marketing, but marketing is one possible application of content strategy, and we derive many common content strategy methods and practices from marketing. Marketing is the practice of bringing products to market and persuading people to buy them. The products involved may be literal—eggs, laptops, ebooks—or metaphorical—ideas, experiences, political candidates—and the means may include techniques ranging from the obvious to the extremely subtle. Content strategy is not a subset of marketing, but marketing is one possible application of content strategy, and we derive many common content strategy methods and practices from marketing. This cultural ambivalence about the arts of persuasion is nowhere more clear than in the world of marketing. When we create content for businesses and other organizations, we usually need to do more than inform or entertain. In theory, there are exceptions—newspaper sites and so on—but for most businesses and institutions, online content is also intended to intrigue, to persuade, and ultimately, to sell. Happily, this doesn’t mean that Web sites should be like direct mail. Sometimes selling is so subtle as to be nearly invisible, and sometimes it’s as straightforward as saying “we made this cool thing that you can use to do great stuff—would you like to buy it?” Mostly, it’s somewhere in between. And the principles of persuasion, or rhetoric, and selling, or marketing, are something that modern western civilization has down cold. Rhetoric constitutes one of the three parts of the trivium—a big chunk of the old-school classical education—and is also a highly contested field of academic study. I will now oversimplify to the point of cartoonishness. The rational argument, or logos—Our widget will produce these benefits for your company, as you can clearly see from this table of research data which I have printed in six-point type. Ta-da! The emotional appeal, or pathos—Happy memories are the most precious things in our brief, sad lives. Won’t you buy this widget to make you some happy memories? The appeal grounded in the speaker’s reputation or character, or ethos—As a thought leader in the fields of both thought and leadership, I tell you: Buy this widget. You won’t regret it. The principles of rhetoric are embedded in our culture of communication, appearing not only in marketing, but opinion columns, blogs, and, of course, political speeches—the latter being the original rhetoric, from the world’s original democracy. Our flowers are the freshest. Our flowers last 30% longer and are more beautiful because they’re so fresh. Vibrantly fresh flowers will make your life feel beautiful. Our family has been in the floral business for 100 years. We know from fresh. We’re less hassle than other hotels. Choose us and you ’ll spend less time during registration and checkout. Guaranteed. From the moment you walk in the door, you’re in your own personal office—or private executive lounge. We’ve served more traveling executives than anyone else, so we understand what business travelers need. Our academic programs are strong. Most of our programs are ranked in the US News and World Report Top 25, and 70% of our graduates go on to pursue master’s or doctoral degrees. Apply here to study with the most inspiring professors this side of Hogwarts. We are the most selective state university in the US, and our faculty offers an unparalleled reputation for excellence in their fields. In most cases, at least some brand messages will have been handed down from an internal marketing group. And remember, if you’re working on content strategy and you’ve been given only top-level messages, you’re well within your rights to push for more specific messages to help you shape your content. In fact, doing otherwise would be a mistake. Marketers have made a science of online performance analysis…. Marketing people—and especially their advertising brethren—succeed when they persuade their target audiences to act in a particular way. In other words, they can measure success by measuring how many new desired actions they’ve inspired. In the print world, this has long been a sticky problem. If you run shampoo commercials on television while also putting ads in magazines and on the sides of city buses, how will you know which part of your campaign is helping the most? This problem is why marketers invented coupons and discount codes—they’re trackable. On the Internet, things are different and just about everything ad-viewers and other Web users do can be tracked and analyzed. In the last 15 years, marketers have made a science of online performance analysis, and there’s an intimidatingly large body of literature—well, maybe not really literature—on the subject, about which more in Chapter 3. For now, consider this: if you’re going to work with content on the Internet, you need to make and execute a solid plan for determining whether or not what you do works. If you’re coming to content strategy without a marketing background, it may be hard to tell the broad, genuinely useful approaches from the Google-Ad-Your-Way-To-Success stuff. I quite like Eric T. Peterson’s Web Analytics Demystified and The Big Book of Key Performance Indicators, which take a more holistic approach to performance measurement than most books that focus exclusively on hit counts and click-tracking. Both books are out of print, but both are available as free downloads from the author’s Web site. And channel strategy? That’s the part where you use all the things you’ve learned about your users and your business goals to figure out the best way of getting your content to your humans. Marketing people have been thinking about this for a long time, and have a lot to teach about it. Note—You may have noticed that I don’t really talk about Web content in this book. That’s because the Web is just one piece of the online content world, and Web versus not Web isn’t an especially useful way to think about distribution. “We’ll put it on the Web” isn’t a very helpful distribution plan—much less useful than “this would be a good thing to summarize in the blog, publish as a full-length article on an external Web site, and mention in our newsletter and social media channels,” or “this piece can be a video podcast, with segment-specific cross-promotion on other channels. Information scientists … work on ways of effectively storing, retrieving, and disseminating information. Information scientists come in many flavors. Some of them are librarians, archivists, data analysts, informaticians, digital curators, and other info-slingers with a very wide range of titles. They have one thing in common, which is that they work on ways of effectively storing, retrieving, and disseminating information. If your native approach comes from editorial or marketing work, prop your eyelids open, because this matters for you. Here’s why: information science gave us much of what has turned into the modern practice of information architecture, which is what saves our slaved-over and expensive content from dissolving into a formless puddle of goo. Information architecture is the design of structures for information, including navigational structures and content taxonomies. The people who do this work strive to bring order to chaos and build structures that help users find what they’re looking for and accomplish the tasks they set out to do. They create marvelous items like wireframes, site maps, page diagrams, and user flows, and often also do enormous amounts of user research beforehand. If you’re working with an information architect, you may not need to concern yourself with the details of structural design except in areas where content strategy and information architecture overlap. Navigation labels and taxonomies are one obvious conjunction, particularly for content strategists with an editorial background. Detailed wireframes can bring together structural thinking with actual content—or at least, very good example content—long before visual design begins, thus giving both the information architect and the content strategist time to discover gaps and potential conflicts. Beyond specific deliverables, though, even more interesting collaborations are possible. Design often requires input from content people and programmers as well as information architects; content management system specifications can likewise benefit from this input. Of course, if you’re not working with an IA, but you are involved in a serious site-building or redesign project, you may have to be the IA as well as the content specialist. And while it takes years of hard work and scads of hours spent in deep thought to get really good at information architecture—or anything else worth doing—you can start using the techniques and tools of information architecture almost immediately. User proxies like personas and scenarios can be tremendously helpful even if they’re scribbled in crayon, as long as they’re grounded in research and based on reasonable assumptions. Even rudimentary wireframes can save an IA-less project from falling into chaos, and all content strategists can benefit from a solid understanding of the principles of usability and findability, both of which are essential to information architecture. You know how Web sites all used to be made of individual, hard-coded HTML pages? That sucked. If you weren’t around for that part of the Web, think of it as the scribes-in-monasteries period of Web history during which all written human knowledge was hand-copied by very pale guys with poor eyesight. The invention of the Web has been compared to Gutenberg’s introduction of movable type, and for good reason—but on the Web content side, our communication revolution really took place when software developers brought the database-and-display-template systems of the old offline computing world onto the Web in the form of content management systems. The first major content management systems were the lumbering and expensive descendants of old-school document-management systems. So corporate and institutional content managers—mostly known as Webmasters at that point—were the first ones to break out into the daylight of content management. All the content that had been tortured into blocks of HTML was suddenly given a home in a database, which meant that revising the boilerplate suddenly meant making copy changes in one or two places, instead of five or ten. Site redesigns began to seem just hard instead of utterly impossible. Eventually, both blogging software and open-source content management systems emerged, and while the former got more sophisticated, the latter got easier and easier to use until the two were indistinguishable. Anyone with basic computer skills could publish content online, and major online publishers could do their work more efficiently and for less money. As of 2010, WordPress, the most popular blogging-application-turned-CMS, has nearly 30 million users worldwide and powers approximately 12% of all Web sites. Develop content-management system (CMS) requirements. Manage the preservation of information—archiving and backup. Implement and optimize site-search tools and processes. Define and maintain taxonomies, tagging systems, and metadata. Most content management on the Web happens under the guise of another role. Some people who do content management are Web editors. Others are information architects, user experience generalists, Webmasters, community moderators, or all-around IT staff members. On the other hand, there’s also an entire professional field—digital curation—complete with academic and professional journals, curricula, and PhD programs, that deals exclusively with the preservation and retrieval of content. In addition to being descended from other fields, content work can never be fully extricated from the sibling disciplines that surround it. Content strategists need to understand enough about visual design to know when content is being presented in a way that is attractive and easy to read; they need to know enough about accessibility to plan for making content available on a wide range of devices and to users with disabilities and special access requirements; they need to know enough about search engines to make content discoverable to users of internal and external search tools, and to hold their own in conversations with SEO-maddened marketing managers. Finally, there is the question of content development. In its purest form, content strategy does not produce content. It produces plans, guidelines, schedules, and goals for content, but not the substance itself, except inasmuch as examples are required to illustrate strategic recommendations. But if you have the ability to create good content, you’ll have a real advantage over content strategists who do not. And now, enough of theory. It’s time to take a closer look at the ways in which all these abstractions play out in the real world.